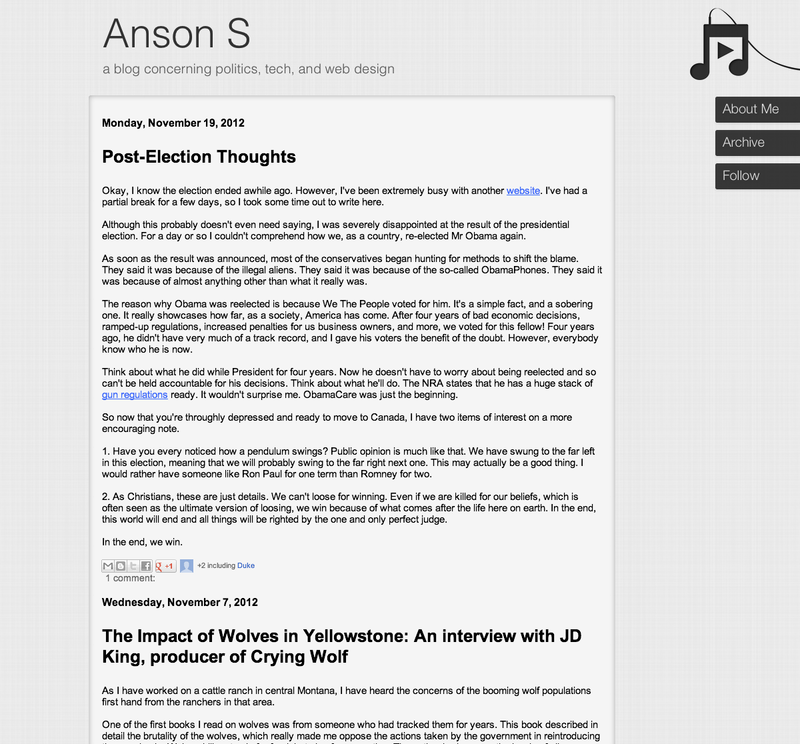 Anson S: Blueprint 4.1 "Paper"
"Blueprint 4.1, codenamed "Paper", ushers in the latest epoch in the madly successful series of blog re-designs by Caleb Grove of OnRamp Web Design." "Is this kid crazy? This is the fourth redesign for a blog that's been running just under a year!" Guess what? You're right. I am crazy. If I wasn't, life would be sooo boring! Blueprint 4.1 ("Paper") has been my most time consuming re-designs so far. I built it from scratch. It's interesting to see how my blog has evolved over the year. The first one I built in iWeb, a now discontinued piece of WYSIWYG software from Apple. The second was built by mixing Freeway Pro 5.5 and Blogger. The third was just a facelift. Now we have this one, also built with Freeway, but with a lot of hand-coded CSS to further customize the appearance and more advanced tweaks. The other big change, besides the new interface, is new fonts. It used to be that a webdesigner was restricted to about 11 font choices, because those were the only fonts that were universally available on almost all computers. However, now we have web fonts, which, although they have the potential of slowing down a webpage, allow for much more creativity without having to revert to graphic text. Much like my last design, I plan on converting Paper to a Freeway template. I'll announce it here. You can still download the template for 3.x, codenamed Smart, from here. So, what do you all think of the new design? Arg. I'm working on getting some good looking social buttons to work. ShareThis breaks the page, and AddThis doesn't seem to have what I want. Hmph. It certainly doesn't look like a Blogger blog; interesting re-design. If you don't mind my asking, what are you favorite and least favorite aspects? The change is pretty dramatic, so that's the only downside I can see...well, there are two downsides. I can't seem to find the +1 button. I like the new font, sidebar, and body, though. Like I said, it certainly doesn't look like a Blogger blog. I've removed the +1 button, at least for now. The G+ button does almost the same thing though. Thanks for letting me know that you want it, I might put it back. (Yuck, I need see if I can style the font in this comment box).